The name of a 1970s rock band came to mind during one of my first nights back in Mobile. But it was one dog, not three. Our Louisiana Catahoula Leopard dog Sue does not like cold weather. Cold is subject to definition, since many folks up north would gladly take the temperatures that Mobilians consider cold. It is usually in the 50s at least (15C) by mid-afternoon, even if it gets down around freezing during the night. 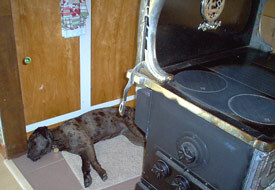 Being a short-haired dog, Sue prefers to stay inside and sleep behind the wood stove in the kitchen. If she gets cold at night (she sleeps in the house in her own dog kennel) she has to find another solution, since we don’t keep the wood stove burning all night. So it was quite a surprise when Sue showed up at the side of my bed around 4 a.m. the other morning and tried to climb into bed with me. She weighs 57 pounds, so it was a bit of an effort for a sleepy, jet-lagged guy to keep her out of bed. I finally coaxed her over to Monica’s side of the bed. Fortunately the "cold" weather doesn’t last long down here, so there shouldn’t be too many more one dog nights.